Last week I sliced off part of my finger. There’s a lot I can’t do: Wash dishes, drive, bike, lift heavy things that need both hands, chop, fold laundry, write, knit. Mark has been working extra hard at home, and I’ve been putting my five- and seven-year-olds to work as well. I can’t grip with the hand, so I can’t bike, and I surely don’t want to drive with only one hand. I’m sure many people who don’t have other options would drive anyway. For the most part I haven’t needed to go anywhere, and I’ve felt so terrible I haven’t wanted to go anywhere in the truly foul weather we’ve had the last several days. I did walk to the pharmacy last night, and was glad to get outside with the kids this morning. I can take the bus to the doctor if I need to, though I won’t be taking the kids on the bus any time soon. Four kids on the bus is stressful enough when able-bodied! The night it happened I got a ride to urgent care from a very generous neighbor. I certainly couldn’t transport myself, was not up for taking the bus or dealing with a cab, and Mark needed to put the kids to bed. I was so grateful to have someone who would drop everything to spend the evening at the doctor with me. Beyond the new transportation challenges to navigate, it points back to one of my mantras: If you are careful, you don’t have accidents. I tell it to the kids all the time when they do stupid kid stuff. It’s obvious here: I was in a hurry because dinner was late and everybody was cranky hungry. I needed to get the sage chopped so it could go in the pot with the squash. I had no intention of a self-inflicted kitchen knife wound, but I wasn’t careful enough and this time I got really unlucky. And it happens all the time on our streets. Nobody gets in a car intending to kill someone, but we are in a hurry and get careless. Most of the time we get lucky and the stupid stuff we do with our cars only results in a close call. Occasionally we get unlucky and our carelessness has horrific results. I didn’t check my blind spot and the pedestrian came out of nowhere. I tried to dart through a gap in traffic that wasn’t quite big enough. I wasn’t watching carefully enough when I approached the playground. I didn’t see that the car in the other lane had stopped for someone in the crosswalk. All of these deaths were most likely preventable, if only someone had cared enough to be careful. All of these deaths were labeled as just horrible accidents. But if you are careful, you don’t have accidents. As I understand it, in the Netherlands, the person operating the more dangerous vehicle has a duty to be careful enough not to collide with the more vulnerable user. This results in an admirable safety record. Of course, they also design the streets to make it easy to be careful enough and are continually refining the design. We are not helped by street design here, but that just means that people driving must be even more aware of the power they wield and take commensurate care. A culture where drivers are careful enough not to have accidents is possible, if we care enough to make it so. The Kirkland Neighborhood Safety Program is a good idea in theory and one that should continue, but it is not a substitute for the city fully supporting transportation by foot or bicycle. The South Rose Hill experience was (and is) a frustrating one for me, and I only provided a bit of feedback (so I can’t imagine how Rodney Rutherford and the others, who actually worked on the submission, feel about it). Seattle seems to have a decent process with its PARK(ing) Day, where residents provide ideas for improving the city. The focus is on transforming parking spaces into useful city space, though the projects have moved beyond parklets into things like protected bike lanes. Ideas can be detailed or vague, partly because Seattle Neighborhood Greenways steps in and assists with some of the designs. However, there are two key things about the city’s involvement. 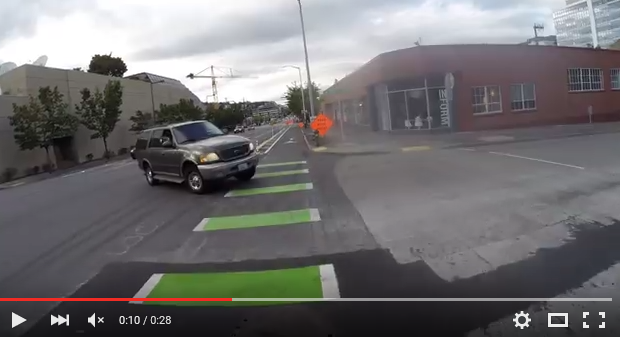 First, Seattle has embraced Vision Zero and is making real safety improvements. Second, Seattle supports PARK(ing) Day, and while there may still be obstacles to overcome, they encourage submissions and want them to succeed. An aside: This isn’t to say that Seattle is perfect. There are certainly complaints about aspects of the safety progress. PARK(ing) Day itself is limited to parking spaces and projects that do not affect the flow of traffic. Sort of. Last year there were successful projects of this type, but this year it seems that the traffic folks were not involved. I submitted a median at Dexter/Thomas based on my Examples of Turns post, but it had to be rejected from Seattle Neighborhood Greenways’ contest for their support because the parking folks said no. While it might still have had a chance if I pushed on it myself and met with the city’s traffic folks, that was beyond what I was able to do. Another way of stating the problem is that there isn’t an equivalent program for transportation, so people try to force these kinds of projects into PARK(ing) day. Kirkland, on the other hand, is missing these two things. While the city seems to recognize in its 2035 documents that automobile travel isn’t efficient enough to scale to meet transportation needs, it doesn’t seem to understand what this means, continuing on mostly car-centric designs with money occasionally spent on pedestrian/bicycle projects that don’t interfere (and more often asking for funding for them). This then leads to opposition from staff for neighborhood safety grants that might infringe on the car culture. Furthermore, because of this, submissions need to be somewhat complete engineering-wise since the city is pushing back against them rather than helping to complete them. It comes as no surprise that things like staircases to the CKC lead the way on the project list. These are, in fact, good connections to make, but they have the added bonus of being out of the way. Things that don’t really affect driving show up as well: plain crosswalks, a radar speed sign, and pedestrian flags. Yes, Kirkland is getting more pedestrian flags, ensuring more years of mockery from the rest of the world. I suppose the only bright side is that those that requested them will feel safer and more likely to walk. The most intrusive provisions are a traffic circle (in Norkirk, and I’m familiar with the details of this project) and Rapid Flashing Beacons (in Finn Hill and South Rose Hill/Bridle Trails). The project lists can be seen on the city’s web page or in the Kirkland Reporter. The South Rose Hill/Bridle Trails group was looking for safety at two intersections. 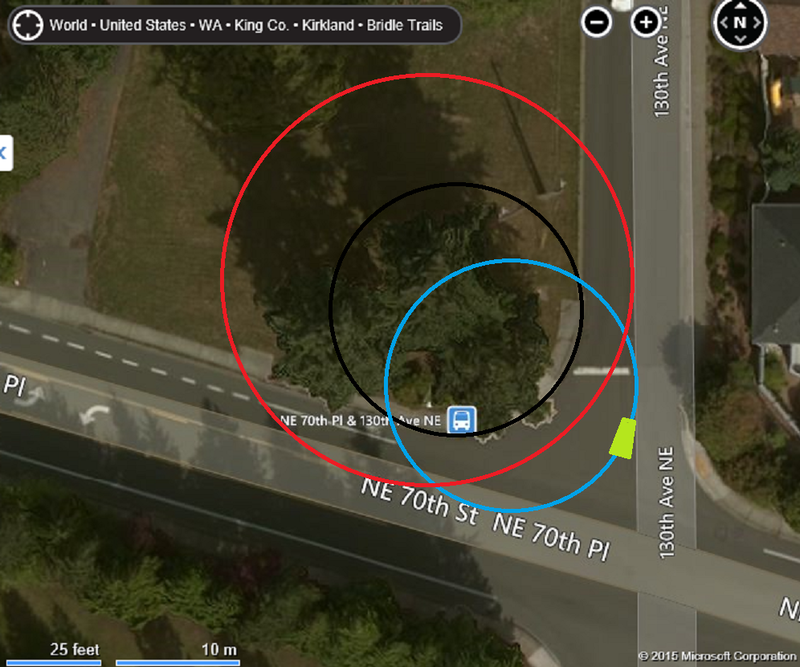 The first was NE 70th St/130th Ave NE, which is the crossing used by a large portion of the South Rose Hill Neighborhood to access the shopping center there. There are also reasonably popular bus stops on both sides of the intersections (it and others serve the same neighborhood and these ones specifically serve the apartment buildings near the shopping center). All four of the pedestrian crossings are much too wide, to the point where I usually walk a section of 130th without a sidewalk rather than attempt the crossing (also discussed in Examples of Turns). However staff was highly resistant to reducing the turning radii or adding any medians for fear of affecting the car flow. We will actually get a painted crosswalk and beacon for one of the four crossings, which will still be a scary, wide crossing with the possibility of getting run over in the center turn lane. The other three crossings will be unchanged. We’re also still waiting for the work (most of the projects are in this state), which currently is supposed to happen “late 2015 or early 2016”. In the meantime, the crossing is terrible. The second was at NE 80th St and 124th Ave NE, which is one block from Lake Washington High School and also within walking distance of Rose Hill Elementary School. It’s a disaster of an intersection. Even alone and running I will cross midblock or use another route to avoid any of its crossings. All suggestions of medians or calmer turns were rejected with “needs more study”, which I believe simply ends the discussion since I haven’t heard of any such study occurring. The Kirkland Reporter article included a quote from Mayor Walen: “This is responsive government solving problems.” I wish, Mayor, I wish. After writing about turn sizes abstractly, I want to examine some real intersections. First is the standard Kirkland (and elsewhere) residential intersection. Kirkland uses wide residential streets (24, 30, and sometimes even 36 feet) and 25 foot curb radii on them. Parking spots near intersections are rarely used; it’s illegal to park closely and there’s no reason to do so with tons of other parking on almost every street. If we assume that 10 foot lanes lead to turns closely corresponding to the curb radii, then these lane sizes leave an extra 2, 5, and 8 feet. Further assuming that both streets are the same width (so, for example, a 24 foot street meeting another 24 foot street), this translates to possible turning radii increases of 7, 17, and 27 feet! Even the more common middle size pushes that 25 foot curb into the 40 foot classification – suitable for “moderate” speed car turns, or in other words not slow ones. If the cars encroach a bit into the oncoming lane, these numbers get even bigger. Next is our local favorite, NE 70th St and 130th Ave NE, and specifically the left turn onto northbound 130th. The center turn lane is 12′, leaving some extra space. 130th is 30′ across, adding a lot of extra space. Worse, it’s quite common for drivers making this turn to greatly cut the corner. I’ve seen cars fully on the stop bar. Here’s a drawing (map from Bing) with the curb (black), a fairly proper turn track(blue), and an observed turn track (red). These are intended as tracks of the inside of the turning car. It’s interesting that when the corner can’t be cut (blue track), even being far from the curb doesn’t allow a larger turn. Experience matches this observation; when a car is fully past the stop line (which is necessary for visibility), this turn must be taken pretty slowly. 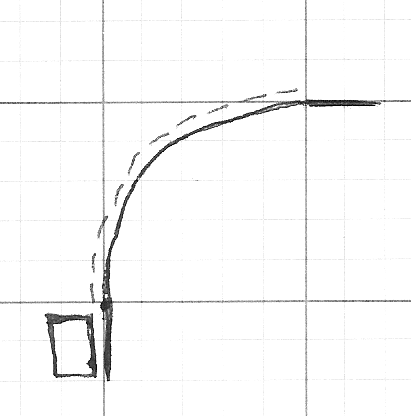 However, cutting the corner greatly increases the turn size. A very rough measurement suggests that the 30 foot curb radius turns into a 50 foot effective turning radius. Again experience matches this; cars on this path are moving quite quickly. And this is one reason why I prefer to walk up the west side of 130th without a sidewalk over crossing to the sidewalk on the east side. 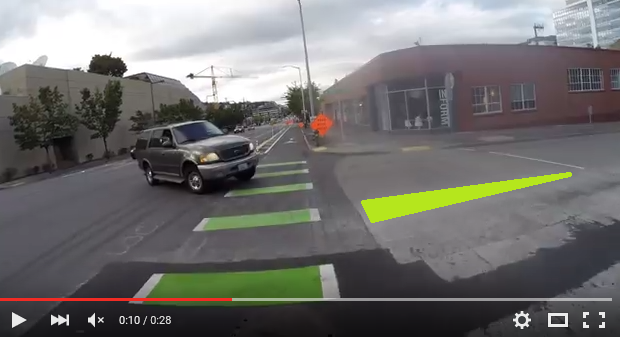 This driver is cutting the corner exactly as described above in the Kirkland intersection. This leads to a higher speed, which leaves less time to see the cyclist and less time to do anything about it. It looks like the driver may have sped up and turned more sharply. With more time, stopping would have been a more viable option. We need to be careful to provide a reasonable but slow left turn path, but with any placement of an island, the red path becomes more obviously ridiculous. This modifies the vehicle path at least as much and creates a perpendicular crossing of the bike path. It essentially applies the protected intersection design to a left turn rather than the usual right turn. I’ve never been to this intersection, so someone with more familiarity would need to turn this into a serious design. I’ll add, though, that if these roads are too busy or too fast for a treatment such as these, then the problems and dangers extend far past just this intersection design. 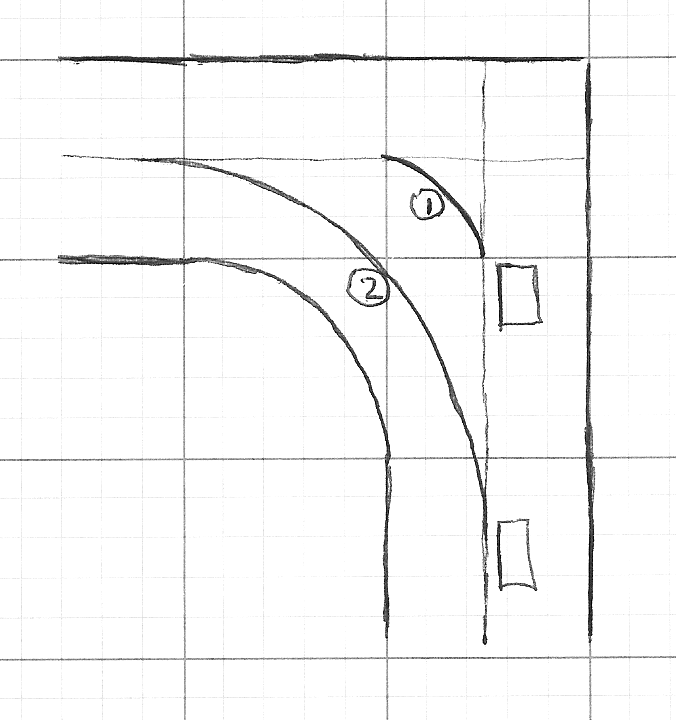 In this post I write about turns at intersections that end up larger than intended. First I need a bit of background on turning radii, but feel free to skim or skip if you’re already familiar with turn design. Roughly every 10 feet added to a turning radius moves it up a classification. It’s a constant battle to ask cities for smaller turning radii. This is partially due to an incorrect “larger is safer” belief (the same goes for lane widths). It is also due to pressure from emergency responders (generally fire) for large vehicle access, which is ironic because we then make our roads less safe in the name of safety. Going further into those arguments is beyond the scope of this post except that it’s worth pointing out that it’s perfectly reasonable for an emergency vehicle to encroach on the opposite lane for a residential turn (even fully, not just a bit) and that it’s certainly possible to design our emergency vehicles to fit safer streets rather than build dangerous streets around large vehicles. My real aim with this post is to discuss the difference between the curb radius and the effective turning radius for an intersection and how this leads to larger turns than intended. The effective turning radius is based on the path that cars actually take. If there isn’t extra room, then a vehicle closely follows the path of the curb. The turn will be slightly larger since the vehicle is going around the curb and not on top of it, but the amount is small. For the rest of the post, I will ignore this difference in order to simplify the drawings. 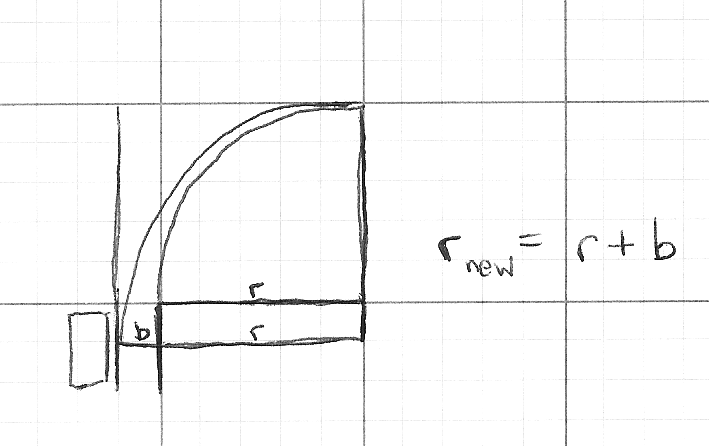 The math gets more complicated if the additional widths are different from each other, so I won’t go further into it. We can approximate the effects or calculate numerical results for specific examples (see Wolfram|Alpha). The most obvious reason for extra width in a turn is simply a wide lane. Passengers vehicles are under 7 feet wide with some under 6 feet. (Examples: Toyota Prius is ~5’10”, Toyota Sequoia is ~6’8″) Safe streets advocates generally ask for 10 foot lanes in residential/pedestrian areas, though in practice the lanes are often 11′, 12′, or even 14′ wide. With 10 foot lane, the vehicle will have 1-2′ on each side, so there isn’t room to swing around and we’ll have that ideal scenario from above. As the lane gets wider, however, there is extra space to be used for increased speed. This space is present in most intersections, and it adds on to any space from the subsequent reasons. A less obvious reason is bike lanes or shoulders. With a standard 5′ bike lane on both sides of the turn, the effective turning radius is increased by about 17 feet, or 1-2 categories in the opening chart! We can directly address these issues. There are other good reasons for smaller lane widths, and this adds one more. Protected intersections put the curb between the car lane and the bike path, removing the additional space from being used on a turn. Abuse of additional lanes is a bit harder to address. Multiple lanes in the same direction shouldn’t exist in pedestrian or bike friendly areas, but they are very difficult (politically) to remove once present. As far as encroachment in the opposing lanes, simply painting the center line can have good effect. (I don’t have any sources handy, but I’ve heard that a center line does wonders for reducing speeds outside of intersections by focusing drivers onto their half of the road. Edit: I’ve also heard the opposite – that they suggest a high speed corridor. Unfortunately the only study I’ve seen combined the removal of center lines with bike lanes and a narrow car travel area.) A stronger solution is some kind of median, which has the added benefit of being a pedestrian island.